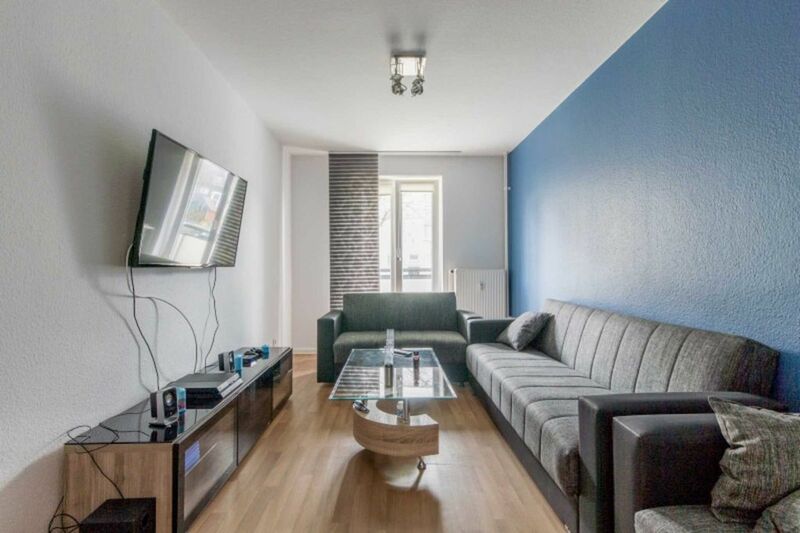 This functional and modern furnished 43 square meter 2 room apartment is located in the beautiful district Mittelfeld. By train it takes about 10 minutes to get to the city center. A total of two people can stay in this apartment. There is a bedroom with a single bed and a sofa bed in the living room. There is also a TV. The kitchen includes a kettle, microwave and fridge. There is also W-LAN and a nice balcony where you can relax. Arrival at the airport: Driving from the airport to ObjektMit the S-Bahn S 5 (direction: Paderborn) takes you directly to the main station. The journey takes about 23 minutes. Am Hauptbahnhof arrived, You will be taken to the underground line 8 (direction: Messe / Nord) to the object station & # 132; & # 147 City Seelhorst ;. The journey takes about 20 minutes. Arrival at the main station: From central station to ObjektVom Central Station then the subway line 8 (direction: Messe / Nord) to the object station & # 132; & # 147 City Seelhorst ;. The journey takes about 20 minutes. Connection from the house to the fairgrounds: from the metro station & # 132; city Seelhorst & # 147; where you can take the line 8 (direction: Messe / Nord) to the fair - the main entrance Messe / Nord. The journey takes about 4 minutes. Connection to the city center: From the subway station & # 132; city Seelhorst & # 147; where you can take the line 8, 18 directly to the city center (metro station & # 132; & # 147 Kröpcke) connection by taxi. Check 3.20 EUR + about 2.20 EUR per km (The prices are non-binding information) .A taxi you can go directly to: taxi-driver card-hanover. order de. Shuttle service (up to 4 people.) From the airport to the object: On request we can arrange a shuttle service from the airport to the object and back. Price: up to 3 people & # 150; 45, - EUR per trip. Payment is made in cash directly to the driver.